The Research Unit Biomechanics and Motor Control of Human Movement is embedded in the Department of Movement and Sports Sciences at Ghent University. It is co-managed by Prof. Dirk De Clercq, Prof. Matthieu Lenoir and Prof. Frederik Deconinck. This unit consists of two closely collaborating research groups that investigate the performance, training and learning of motor skills in daily life situations and sports. Our research is relevant to individuals of all ages and physical abilities and involves both laboratory and field testing. The research group of Biomechanics of Human Movement performs state of the art analysis of human movement by combining kinematic and kinetic measurements, often in combination with electromyography. Through a better understanding of the neuromechanical interaction of the moving body and the environment, we aim to answer research questions related to the optimisation of learning processes, (sports)performance, and musculoskeletal loading. A first research line, locomotion biomechanics, focuses on modulation of impact loading in distance running, determinants of gait transition, and player-shoe-surface interactions during fast cutting manoeuvres. Secondly, locomotion related injury risk factors are determined and translated to broader intervention studies on primary prevention of sports injuries. 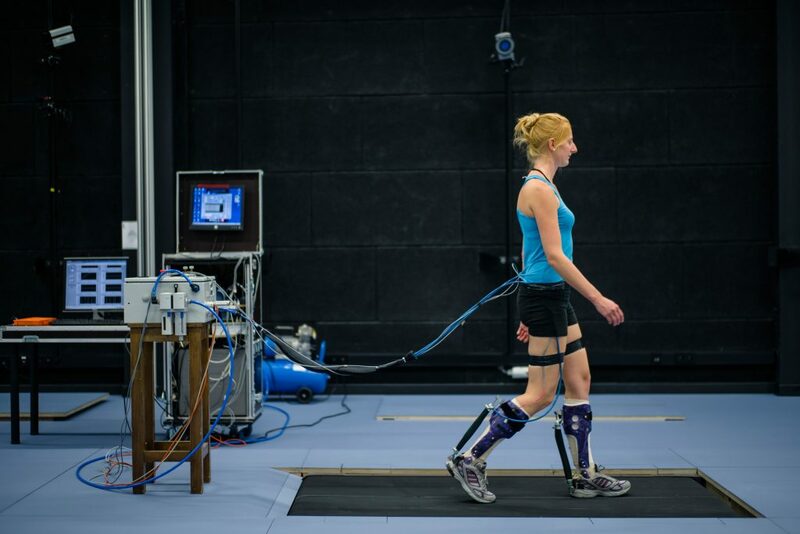 A third line of research is involved with developing efficient exoskeletons that assist human walking in able-bodied as well as impaired individuals, by conducting optimization experiments that allow to understand how the metabolic cost of walking can be reduced. Finally, we perform sports biomechanical analysis in situ, e.g. on elite high jumping. The research group of Motor Control of Human Movement seeks to better understand processes involved in the development and control of skillful human behavior. Our research involves the detailed study of motor competence in order to reveal the intrinsic (individual) and extrinsic (environmental) factors explaining differences in competence. To unravel the mechanisms of human motor control and the role of sensory information (visual, auditory, kinesthetic) we study human movement and gaze patterns during different motor tasks while manipulating sensory feedback. Our target populations include children with obesity, children with movement disorders, typically developing children and elite athletes. With our research evidence we aim to optimize motor learning of complex skills (e.g. bicycle riding) and to support elite sports clubs and federations with structured talent identification. video screen, head-mounted and head-free eye tracking systems.